What Are Explainer Videos And Why Do You Need Them? Explainer videos have been around for a couple of years, however, not many people or companies know very much about them. The lack of knowledge surrounding explainer videos means that there are a number of people and companies who are missing out on the opportunity to create and use them to their advantage. We are going to explore what explainer videos are and why you need them in this article, ensuring you have all the relevant knowledge needed to implement this important type of content in your business’s content plan. Explainer videos are a fun, factual way to explain who your company is and what its products or services are through short one to two-minute online marketing videos that are usually – but not limited to – created in animation form. Recently, explainer videos have become increasingly popular, as more and more companies are investing their time and money into creating eye-catching content to place on their home page, a landing page, or even a popular product page, in order to reach their customers in creative and innovative ways. There a number of explainer videos that companies can choose from, ensuring they have the option to invest in the one that better suits their company and its needs. Explainer videos can take the form of Live Action Explainer Videos, Animated Explainer Videos, Whiteboard Explainer Videos, and Kickstarter Explainer videos, each of which caters to different audiences, benefits different company’s needs, and puts across a message in the appropriate format. Why you need Explainer Videos? Most companies may feel that they do not need to invest in explainer videos, whether that be because they feel it may not fit well with their brand, or because their company doesn’t have a suitable budget for one. However, there are a number of reasons that could change their mind. Video has seen a boost in its growth over the last few years, mainly because Google’s ever-evolving algorithm takes into account how long users spend on your website. Video is an easy and interesting way to get and keep users’ attention while keeping on your website for longer periods of time, contributing to a change in your business’ search rankings. Provides consumers with a clear explanation of your product or service. Although using text to describe your product or service is popular and has been used for as long as we can remember, explainer videos take confusion completely out of the equation and instead give customers a much better understanding of what you are offering them. They grab the attention of your audience without fail and without boring them. Traditional web content is seen everywhere, every day, making it boring and less interesting to many consumers who – most of the time – skim through lengthy content to get the gist of what you are selling or offering. An explainer video, on the other hand, provides them with an engaging experience, minus the boring material they see everywhere else. Video content is easily shareable. More and more users are finding video content more interesting and helpful, meaning they are more likely to share it on their social media profiles with their friends, family and colleagues. This helps to spread the word about your company and its products or services, and will more than likely attract a number of new customers. Explainer videos will contribute significantly to your business in a number of different ways, with more and more companies choosing to put time, effort and money into attracting new customers while peaking the interest of those who are already loyal to them. What’s more, there is the opportunity to reach so many more people and boost your ranking on Google search results, resulting in more and more people finding your website. For those companies who would like help producing and implementing explainer videos on their website, contact your local SEO agency Dubai and let them guide you through every step of the way. 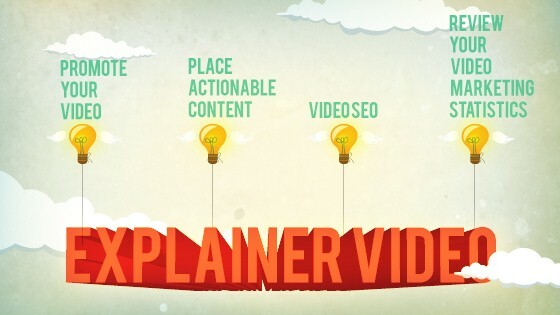 Vyas Infotech: What Are Explainer Videos And Why Do You Need Them?